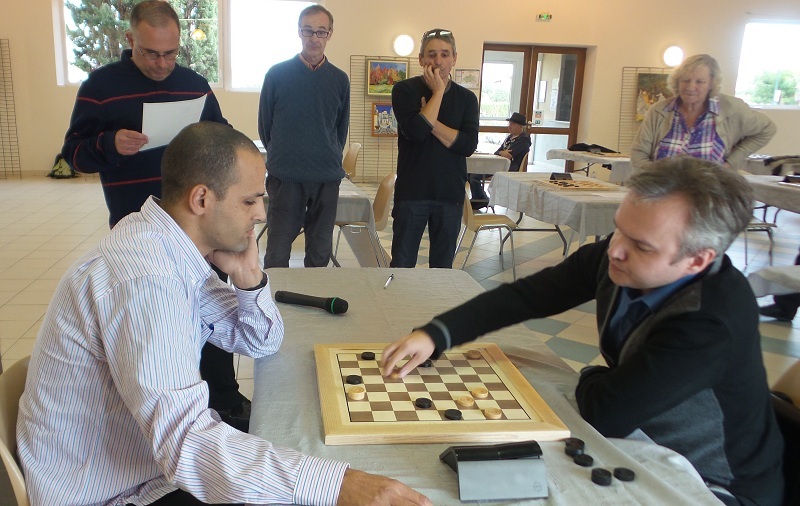 International Draughts Federation (IDF) and French Federation of Draughts 64-144 in accordance with the Calendar of the competitions in 2016 conducted from 22th (arrival day) to 29 (departure day) October 2016 in Mirepoix-sur-Tarn (France) 5th Stage of World Cup 2016 in draughts-64 – International competition “France-2016”. Vladimir Skrabov won Blitz and Classic program. Dmitry Tsinman sent report about tournament. 29-10-2016 5th stage of the World Cup 2016 in draughts-64 completed. The competition was well organized. The organizers met and accompanied participants from / to the airport. 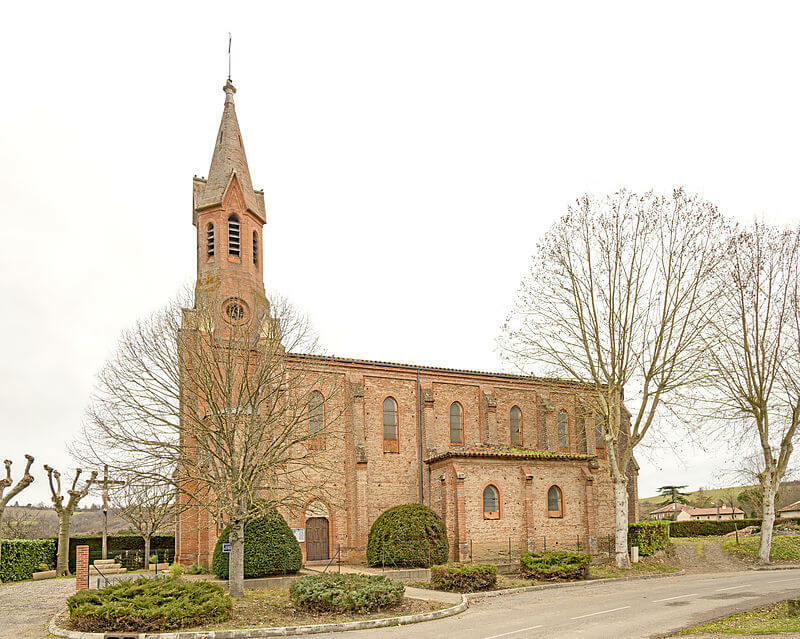 October 22 was held the grand opening, on which the participants was welcomed the measures the city Mirepoix-on-Tarn and the neighboring city, deputies, representatives of the administration, the president of the draughts club of Mirepoix-on-Tarn. The grand opening was completed with a little dance program and a gala dinner. 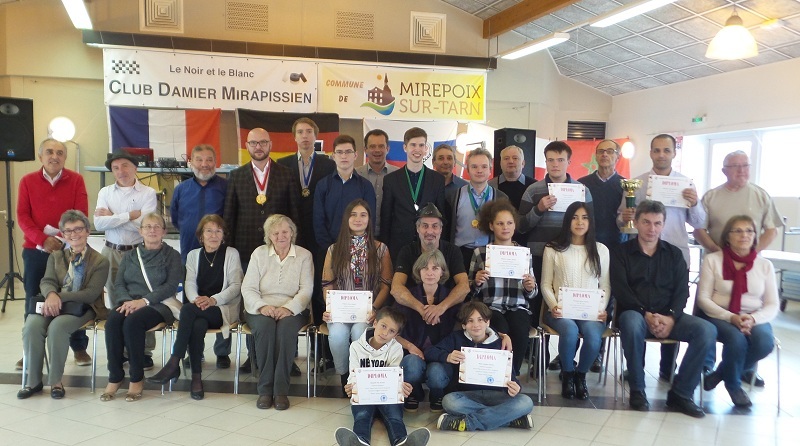 The International Draughts Federation thanks to the administration of the city, draughts club of Mirepoix-on-Tarn and all the inhabitants of the city who took part in the organization and holding of the 5th stage of the World Cup for the warm welcome and the good tournament! 6th Stage of the World Cup 2016 in draughts-64 will start on November 25 in Haifa (Israel). 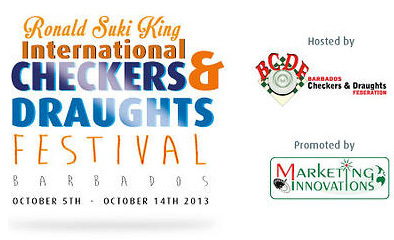 We invite players to participate in this prestigious competition! 28-10-2016 In the classic program of the 5th stage of the World Cup with a score of 13 points won the International Grandmaster Vladimir Skrabov, who played in draw with Andrey Gnelitskiy. The second place with a score of 12 points took International Master Dmitry Melnikov, who won in a bitter struggle Gennady Shapiro. 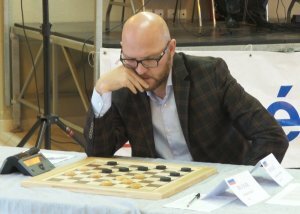 The third place took International Grandmaster Dmitry Tsinman, who failed to win Zhanna Sarshaeva. 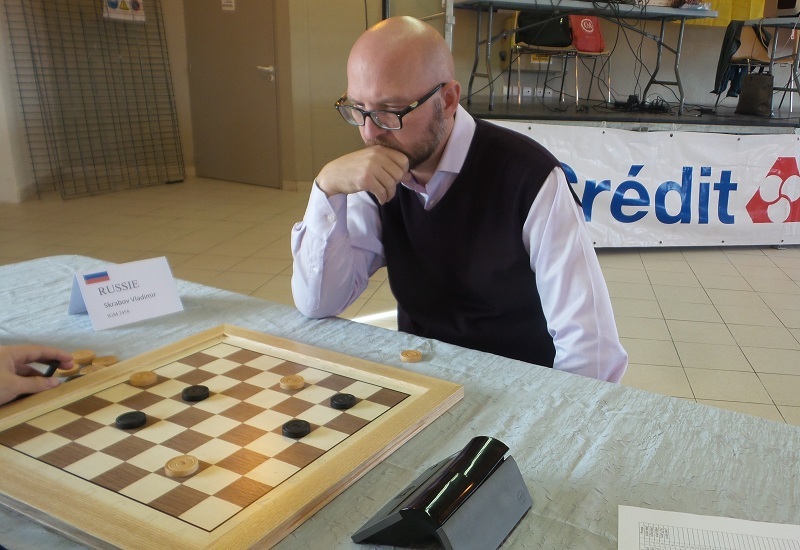 27-10-2016 Before the last round with a score of 12 points is leading the International Grandmaster Vladimir Skrabov. 10 points have International Grandmasters Dmitry Tsinman and Gennady Shapiro, International Masters Andrey Gnelitskiy and Dmitry Melnikov. They will compete in the final round for the prizes. 23-10-2016 Today in the French city Mirepoix-sur-Tarn started the 5th stage of the World Cup – International competition “France 2016”. In classical program in Brazilian draughts participate 23 players from France, Russia, Germany and Poland. Among them are international grandmasters: World Cup 2015 winner Vladimir Skrabov, prize-winner of the World Cup 2015 Dmitry Tsinman, the ex-world champion, European champion among women Zhanna Sarshaeva, prize-winner of the world championships Gennady Shapiro from Germany, national Grandmasters Andrei Kalachnikov and Dmitry Melnikov, prizewinner of World Cup, international master Andrey Gnelitsky, a multiple champion of France, the IDF master Pierre Monet. Competitions will be held on the Swiss system in 8 rounds. Blitz program in Russian draughts started at 15.00. 20 players from 6 countries: France, Russia, Germany, Australia and Poland participated. In Blitz program includes a master of sports Felix Verbuk from Australia, who is now in France. The competition was held on the Swiss system in 8 rounds. Vladimir Skrabov become the champion. Dmitry Tsinman took 2nd place and Andrey Gnelitskiy took 3dr place. 08-01-2016 International Draughts Federation (IDF) and French Federation of Draughts 64-144 in accordance with the Calendar of the competitions in 2016 hold from 22th (arrival day) to 29 (departure day) October 2016 in Mirepoix-sur-Tarn (France) 5th Stage of World Cup 2016 in draughts-64 – International competition “France-2016”. 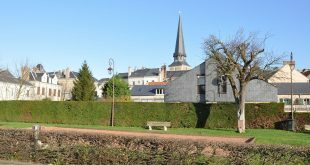 Players will be lodged at Cantélaouselou for €20 per night (24 spaces available and 2 studios for 3-4 personnes). Free transport for the transfers. 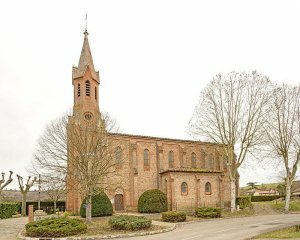 Lunch can be taken in the Primary School nearby (300m). The winning prize will be between €2000 and €3000 (depending on the numbers of players).